This story was updated at 12:05 p.m. EDT. Two spacecraft, one public and one private, linked in orbit today when SpaceX's Dragon was attached to the International Space Station. The historic moment represented the first time a commercial spacecraft has ever docked at the weightless laboratory. NASA astronaut Don Pettit, controlling the space station's 58-foot (18-meter) robotic Canadarm2, berthed the unmanned Dragon capsule, built by commercial company SpaceX (Space Exploration Technologies Corp.), to the space station's Harmony node at 12:02 p.m. EDT (1602 GMT). 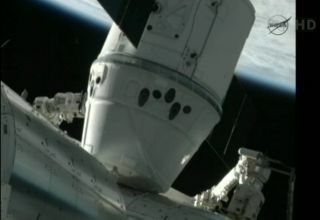 The docking came about two hours hours after Pettit reached out to grab the free-floating Dragon with the arm at 9:56 a.m. EDT (1356 GMT). The Canadarm2 of the International Space Station was used to position the Dragon spacecraft for docking, May 25, 2012. The link-up marks the end of the workday for Pettit and the other spaceflyers helping to welcome Dragon, NASA astronaut Joe Acaba and European Space Agency astronaut Andrei Kuipers. Tomorrow (May 26) around, the crew will open the hatches between the station and the capsule and float inside to begin unpacking the new arrival. SpaceX was founded in 2002 by billionaire entrepreneur Elon Musk, who also co-founded internet payment service PayPal. This mission is the second-ever flight of Dragon, which first launched to orbit in December 2010. The current mission is a test flight under NASA's COTS program (Commercial Orbital Transportation Services), which helps private companies develop unmanned space freighters to haul supplies as a replacement for the retired space shuttles. SpaceX, based in Hawthorne, Calif., has a $1.6 billion contract with the space agency to fly 12 cargo-delivery missions to the space station after this test flight is complete. If the rest of the mission goes smoothly, the first of these could launch as early as this autumn. Dragon's arrival at the space station this morning was somewhat delayed by unexpected readings from one of Dragon's navigation systems. Dragon has been using a laser-based LIDAR system to send laser pulses toward the space station and measure its distance by calculating how long the pulses take to reflect back. Mission controllers realized the LIDAR was picking up stray light reflections from the station's large and shiny Japanese Kibo laboratory that were confusing the sensors. Engineers quickly came up with a solution. "The SpaceX team believes they have found a way to fix the problem with their LIDAR sensors on Dragon," NASA commentator Josh Byerly said. "SpaceX was able to basically adapt their LIDAR sensors onboard Dragon to sort of, for lack of a better word, close its eyes a little bit and have a more narrow field of view." That seemed to correct the readings, and Dragon got back on track to pursue a meeting with the station. However, this and other minor delays pushed back the time for this "grappling" from 7:59 a.m. EDT (1159 GMT). The timing was also dependent on lighting conditions. "They have to do this in daylight because obviously they don’t want the crew trying to capture a brand-new vehicle in the dark," Byerly said. NASA and SpaceX officials stressed that anomalies and delays are normal in such a novel situation. "That is to be expected," Byerly said. "As we keep reminding everyone, this is a test flight." It was launched atop a SpaceX Falcon 9 rocket from Cape Canaveral, Fla., on Tuesday (May 22). The vehicle is due to spend just under a week docked at the space station being unpacked. Next Thursday (May 31), Dragon will be packed with its return cargo — completed science experiments and equipment no longer needed on the station — and sent back to Earth. The spacecraft is equipped with a heat shield to survive the temperatures of re-entry, and the capsule is intended to be recovered by ship crews after it splashes down in the Pacific Ocean.